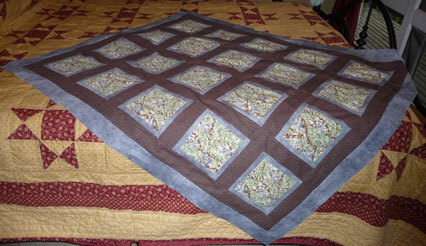 I started quilting in January 2010 and this blog is now almost a year old, too. Time to step back and have a look at my projects so far. We'll ignore the not-yet-started "UFO" closet and concentrate only on the ones that I've actually begun working on. Description: I got into this one not because I wanted to quilt, but because I wanted a bedspred to compliment the wall hanging my mother had made me (and which hangs above the bed in this photo). I didn't expect to like quilting. 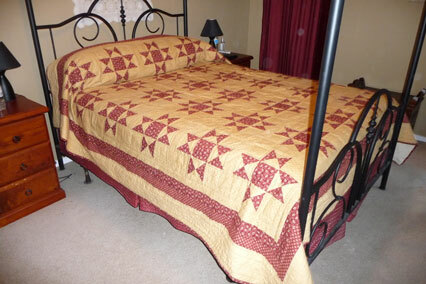 Actually figured I'd hate it, but got into because I wanted the bedspread... and the rest (as the say) is history. Quilt 3: Snowball block kit "Faded Memories"
Description: Made as a gift for a good friend, this was a kit from "Patchwork With Gail B" - my favorite quilting store. It seemed so TINY after the 2 big quilts. 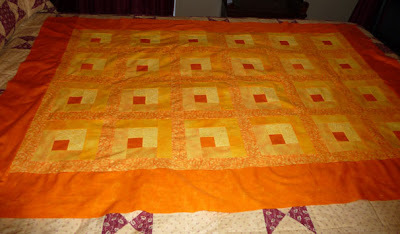 I took this one with me on vacation - worked on it continually and finished it before the 2nd quilt was done. 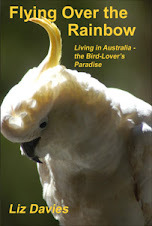 And I will never forget the look on friend Julie's face when I gave it to her (she was delighted). Description: I'm surprised at myself, in a way, for not getting this one at least cut out, but there you are. Breast cancer reared it's ugly head about the time I would have started this quilt and so I set it aside in favor of other, smaller projects that I could better handle during the recovery from my surgeries. Status: Fabric is still in the closet, uncut. But I think about this so much and have studied On Point assembly (which, frankly, has me intimidated) that I'm counting this one as "having been started" just because of the mental work I've done on it. 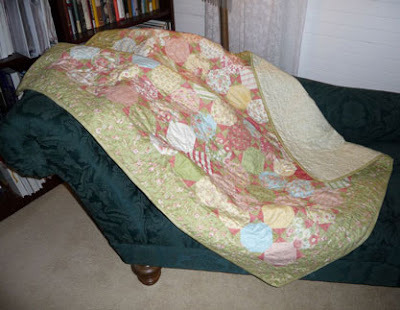 Description: - This project grew out of the inevitable attack of "fat quarteritis" - a disease which I suppose you really can't avoid once you get into quilting. I found the Teal, navy, green and gold prints at a small quilting shop that was going out of business. I bought the fabric without having a pattern (or yardages worked out) so you just have to know I was heading for trouble. But I managed to work through it all and learned a valuable lesson about not diving in without a firm design and being SURE I've got the required fabric. I also figured out after doing about half the blocks that cutting out the little log cabin bits wasn't smart at all - there's a better, easier way to go. Status: In progress - Should be finished by the end of this month. Description: - I love the brilliant sunset colours. With this project (which I started after number 5 but completed long before number 5 was even close to being done) I figured out that the "logs" are easier to do if you use long strips and then just trim (instead of cutting out each little rectangle and THEN stitching). This quilt top went together in a flash. Description: The center blocks are a soft pastel Koala print, just adorable. The brown border is an aboriginal-style bark pattern and the grey is much like swirling clouds. I picked up the koala print on the same shopping trip as quilt number 5, and didn't actually have quite enough, but the store "Patchwork With Gail B." had a bolt of the fabric, so I was able to get enough to make this design plausible. I originally intended this for a friend in Ohio but may have some trouble parting with it because it is "that cute." Description: Oh dear... this was so painful. I thought the bright, fresh clean prints were so pretty and they COULD have gone together beautifully - but only if I'd had a decent design, which I didn't. The big mistake I made was cutting very small triangles out of the 2 leftmost prints. The 2 prints are just too far apart in texture and visual "weight." They need to be seperated by the dark one on the right - but once I realized this it was too late and I didn't have enough of the dark print. Status: Stuffed disgracefully in a plastic bag and shoved to the back of my UFO closet. Awaiting inspiration to rehabilitate this one. 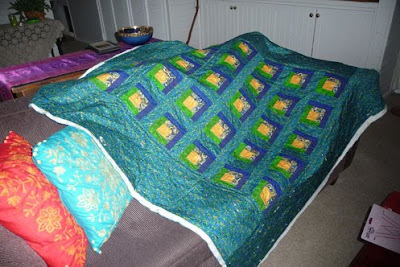 Description: The room where I have my first quilt project gets way to bright and light way too early in the morning. I wanted a drape of some kind to block out light as much as possible, so I put this single panel together. It works beautifully as a light screen. At some stage I'm going to add small bars and pulls and transform it into something of a roman shade (so that it can be lifted when we want the room well lit). But I'm happy with it for now. 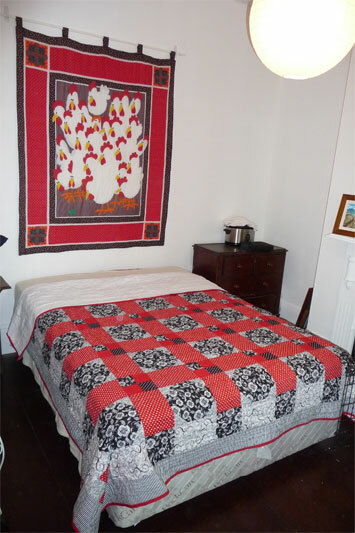 Quite functional and compliments the bedspread and wall hanging on the opposite wall. 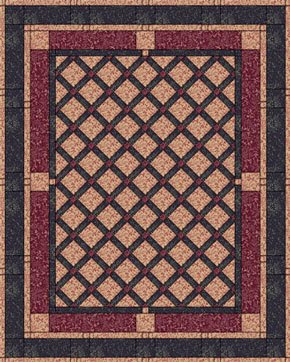 Quilt 10: Modified Snowball Kit - "Forbidden Temple"
Description: Another kit from "Patchwork With Gail B." The photo above isn't too good - but you can get an idea of the overall design. It's just rectangles with little corners of black (snowball blocks made with rectangles instead of squares). 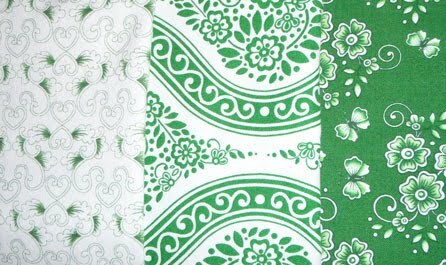 The fabric is all Japanese prints - lively and colourful. The effect overall is like an asian stained glass window - just gorgeous. And I adore Japanese prints. SO THERE YOU ARE! One year, 10 projects. Of course there's quite a bit of uncut fabric still in the closet, and I'm starting to feel the siren call of the quilt shops in my area, so I imagine I'll be going shopping for more fabric soon. My first quilt was a queen-sized bedspread that I made to go with a decorative wall-hanging quilt that my mother gave me years ago. That first project turned out quite well, but there were quite a few good size scraps left (I'm horrible at calculating required yardage). 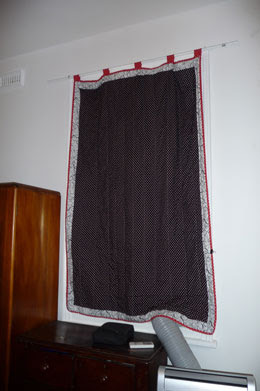 I decided to make curtains for the room (using quilt material will work in this situation, as the window in the room faces into an internal hallway, and therefore never gets direct sunlight). So today I finally pulled out those scraps and got to work. Zip zip zip! Just about 5 hours of work and it's almost done - a "window blind" panel meant to simply hang over the window (and keep the room quite dark). Later on I'll add some loops and cording and make it a kind of "roman blind". Even the batting inside is made up of scraps from other projects! I'm kind-of proud of that. I added an extra layer inside, on top of the batting. I put a layer of black quilting cotton inside in order to block as much light as possible - so the blind, when it's down, will keep the room quite dark. So there I was - pretty much under control. The household budget has been safe for a while because I've been unable to drive during my recovery from surgery. Unable to drive means unable to get to the quilt shop. And that means unable to spend money on fabric. ...here comes an email from Pauline (my friend and quilting guru). 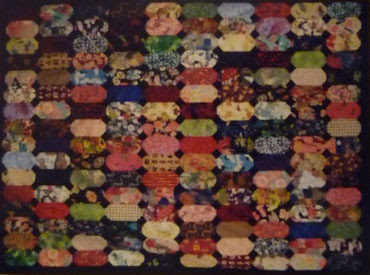 She's found a quilt shop in Beaumaris that specializes in Japanese and Australian prints. Now... Japanese and Australian prints are my current passion - I'm mad for both. This is bad - really bad - but because Beaumaris is about an hour's drive from here, I should be safe. My surgeon has approved me for driving "short distances" - but a trip to Beaumaris is out of the question at the moment. This store has a website - you can order fabric. The online fabric stores I've seen are so horribly designed that it's just about impossible to really "shop". Usually the pages load slowly and are so badly organized that you can't really find things. Not this one. It's incredible. With one click you can see their fabrics - everything on a single page. And that's not all - you can have the assortment organized by colour, by "culture", by manufacturer and design. And... (oh, this is BRILLIANT) whoever photographed the fabric swatches had the brains to put a 50 cent coin in each picture - so you have a way of seeing the scale of the prints. Pauline - where ever you are right now... God bless 'ya, evil girlfriend! When I was filling out the paperwork for hospital admittance before my recent breast surgery I came across a question that threw me a bit. The question on the form asked if I'd ever been diagnosed with cancer. For the first time in my life I had to answer "yes" to this question. It was not a fun moment. I'm grateful, of course, that we apparently have beaten the cancer and that I'm now cancer free. But still, now I've stepped over a line. When you have to say "yes" to "Have you been diagnosed with cancer" you end up having to answer a whole lot of other questions (when? where? and so on). I've never felt unhappy about divulging my medical history, but the cancer questions seemed, well, violating somehow. I felt like pulling the person who made up the form aside and yelling "I'm not coming to you for cancer - this is none of your damned business!" It was not a fun moment.